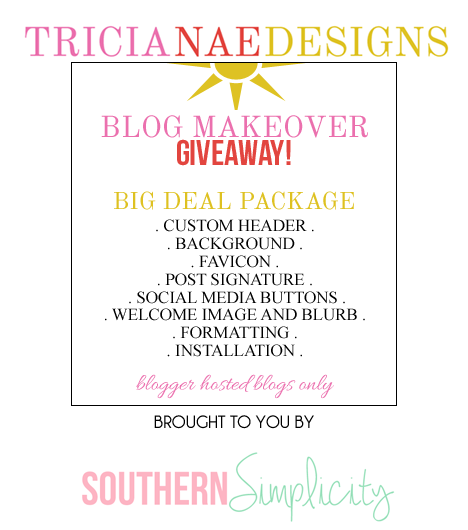 I was so excited when Tricia approached me to do a giveaway for a new blog design for one of my readers!! I am absolutely in love with what she did for my blog and I know you will be just as happy. Tricia was a dream to work with and made my vision completely come to life! You can enter the giveaway with the widget below. The giveaway will run from today, Thursday, August 1st-Thursday, August 8th at midnight! & don't worry--if you don't win the giveaway you can use the code SOUTHERN20 to get 20% off your order with Tricia Nae Designs until September 1st! GOOD LUCK. I loved working with Tricia on my blog a few months back! I posted about it on my blog & twitter! Can't wait to see who the lucky winner is! Would love to win! :) I have really been wanting to get into writing my own blog and that would be the perfect way to really start! This would be perfect for my teacher blog!! I've never had a chance to change anything other than choosing a template! Hope I win!